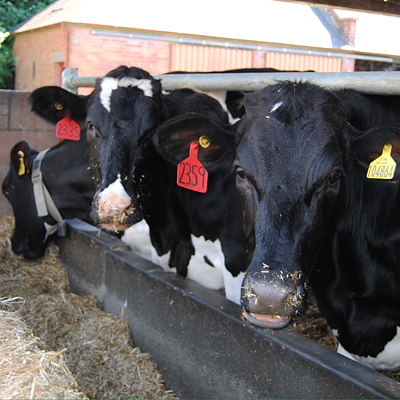 Bovine Viral Diarrhoea (BVD) is a disease of cattle that causes a wide range of cattle health problems such as abortion, infertility, respiratory and gut disorders among other problems. The virus is harboured by a small population of animals that are infected throughout their entire lives after they contracted the disease in the womb. These calves can die in infancy, but may also live a relatively normal life for several years, during which time they are constantly shedding virus and infecting other cattle they come into contact with. If BVD virus was eradicated, research at SRUC has shown that the Scottish dairy industry could save about £38 million in reduced production costs, and consumers about £11 million through less waste. Freedom from BVD is also likely to reduce the environmental footprint of the Scottish cattle industry, increase its competitiveness and improve animal welfare. Because of the hidden nature of BVD and the wide variety of disorders it causes, a key challenge is to assess the extent of the damage it does at farm level, and make this apparent to farmers and their vets in ways that will motivate and guide them towards the best prevention and control responses under specific farm circumstances. To tackle this problem SRUC’s researchers combined epidemiological and economic computer models to explore the relationship between disease spread and the actions of farmers that might influence such spread. Some of these actions (e.g. vaccination, removing persistently infected individuals and reducing the risk of virus introduction to the herd) will be directly related to disease control, others such as replacement strategy and stocking rate will be driven by other business considerations. All will cost money. The economic aspects of the model compared these costs at whole farm level with the likely benefits of reduced risk of disease losses over the period of time needed to eliminate BVD and avoid its reintroduction. This work though focused on farmers actions, helped us to highlight the value of tackling BVD collectively. SRUC research helped to establish health schemes to control BVD of cattle on Scottish farms and subsequently underpinned the rationale for cost-effective control strategies that have been adopted in health schemes around the UK and elsewhere. The farm-level savings to the industry from future eradication (including beef and dairy herds) are estimated by Scottish Government to be £50-£80M. By focussing on BVD, SRUC research and consultancy Divisions helped farmers and their veterinary advisors to identify, understand, and deal with the BVD virus by developing an integrated approach to controlling it. The UK CHeCS health schemes were started which helped derive the cost benefits for farmers to engage in BVD prevention strategies. We publicised the true extent of BVD in Scotland, and at the same time, compared the cost of control with other common cattle diseases, and highlighted the considerable variation in impact depending upon epidemiological, social and economic circumstances. Our work provided a direct evidence base for the BVD eradication programme in Scotland and Ireland and underpinned work elsewhere through collaboration with researchers worldwide. Our approach pioneered interdisciplinary research in animal health, combining science with economics and other social sciences to ensure that farmer behaviour and decision-making contribute to understanding and hence most effectively countering the spread of disease in livestock populations. This research led to and underpinned the establishment of BVD eradication programmes in Scotland and then elsewhere in the UK by developing the eradication programmes; demonstrating the relatively low BVD prevalence in Scottish herds and deriving the economic case for eradication at farm level. SAC Consulting, Royal Veterinary College.